Dynamic skiing utilizes movements required to descend a steep narrow chute or rip down a wide-open bowl. Incorporating an open stance and balanced body angles makes fluid edging rotation, flexion/extension and balance easier and more effective, granting us the freedom of the mountains, helping us carve perfect tracks in untouched corduroy and bounce gracefully down mogul fields. Just because you can make parallel turns does not mean you can successfully ski difficult terrain. Many older skiers ski with their feet glued together; this is like trying to balance on the tip of a triangle. Think about other sports, would you block a fullback or land a jump shot with your feet together? 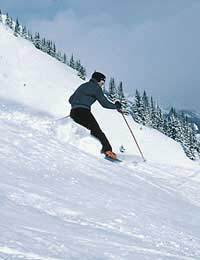 Skiing steep terrain with a narrow stance prohibits proper canting and body angles making controlled turns difficult. For proper athletic stance, your feet should be hip to shoulder width apart, knees and ankles bend forward and body upright, not bent at the waist. A wider stance increases your balance and allows more space for you to extend dynamically down the hill, switch edges more rapidly and twist your hips to spring load your legs for effortless ski rotation. It also gives you more mobility and joint space to react to terrain changes. The sidecut design of modern skis performs much of the work in turns previously “muscled through,” so relax your stance and open your legs. Cowboy Turns: Pretend you are riding a horse. Make turns pretending to be on an extremely fat horse with your legs more than shoulder width apart. Try to carve tipped on high edges. Gradually bring your skis to shoulder width. It might feel weird at first, but turning should be easier and offer more control. Pretend you are riding a horse on any terrain when you catch your feet locked together. Body angles are very important in skiing. If we don’t bend our knees and ankles forward, leaning our bodies down the hill, we’ll fall on our rears. If we don’t twist our hips and upper body downhill, we will have to work very hard to initiate new turns. And, if we don’t bend our knees and hips side to side, balancing our weight over our feet while carving (called canting), we’ll tip over. Steeper angles facilitate deeper carving, but if our bodies follow our skis, we cannot accomplish this goal. Think of your legs as a pendulum separate from your body. They should turn beneath you, while your upper body remains quietly facing down the hill. Just a reminder, as you start a new turn, your skis should be pointing at the uphill 45º point between the fall line and horizon, while your body faces down the fall line. This twist, spring loads your legs, so that when you extend with a hip thrust down the hill, the skis make the turn. In an ideal world, your body will remain facing downhill with your shoulders parallel to the slope, hands up and eyes looking where you want to go (not at your skis) throughout the turn. To practice keeping your shoulders level, balance your poles on your arms like a tray. You are starving and just spent the last of your money on a delicious meal, so don’t spill! Now carve down the hill moving only your legs. Don’t forget to extend downhill at your turn initiation, and finish every turn. You should be able to keep your body “still” and be able to flow over the terrain without being stiff. You know how to make good turns spending time in the fall line and finishing them (if not see Parallel Turns, under the Skiing section); you know how to extend into the fall line at the turn initiation leading with your pole; and you can now ski with an athletic stance and proper canting. Now try various radius turn sizes. Most people ride comfortably in medium radius turns. In one run, switch between small radius, large radius and medium radius turns. Start by making at least five of each in a row, then mix them up a bit. Be sure each size turn is distinctly different. When you find yourself on a narrow chute or long bump run, remember what you know. Twist your hips and body down the hill; perform every part of the turn, extending out and down from the hips to turn your skis to the 45º downhill, into the fall line, across the slope and back up to the 45º uphill. Allow fluidity in your joints to absorb terrain features and keep your stance wide for balance. Then stop thinking, growl for aggression and have fun!